Today's WOW guest is Suzanne Lazear, who writes Steampunk tales for teens. 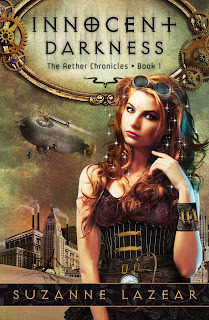 Her recently released debut novel is called Innocent Darkness: A Steampunk Fairytale from Flux. Suzanne plays with swords, runs with bustles, and is rarely described a normal. She lives in a small corner of the West Coast with the hubby, the tot, two chickens, and a hermit crab. You can find Suzanne on her blog, on twitter or on Facebook. Getting the call (or in my case the email), is an incredible thing. It’s that magical moment where you’re validated as a writer that someone other than your friends like your writing, and that person thinks others will like your story, too. Suddenly, all those hours you’ve spent writing your story (and probably more than one), the querying, the pitching, the waiting, all the classes, contests, workshops, and beta reads, finally pay off. For me it was incredible. I was unemployed when I sold Innocent Darkness, my YA Steampunk dark fairytale. In two weeks I sold my book, got an agent, and found a job. Yes, in that order. Not long after I sold, I attended the RWA National Conference. My badge had a little pink “first sale” ribbon on it and I nearly cried. That conference as a brand-new published author was *so* different from the one I’d attended the year before. I also found that I learned so much more. Listen and learn. There is so much to learn from other published authors—newbies and experienced ones alike. As excited as it is to share your news and book, make sure to listen, too. In my experience, other authors are only too happy to tell you there experiences, and answer your questions—even ones you think are “dumb.” I have learned so much from listening to my friends’ stories. Be humble, but don’t be too hard on yourself. The journey from writer to author is different for everyone. Remember you where there once, too. Also, remember that everyone has to start somewhere, and our starting places are all going to be different—and that’s okay. Take advantage of what you do have and make it work for you. Dwell on the positive. Be happy for your friends. Writer friends are a necessity. Who else are you going to call in a mad panic at some odd time? Be happy and help celebrate your friends’ accomplishments no matter what stage they’re in, whether it’s finally finishing that first MS, a new contract, or making the New York Times bestseller list. Keep learning. Sure, I’ve sold a book, but that doesn’t mean I know everything about Steampunk or writing. I do share what I learn, but I keep on learning and growing. I keep working on my craft, making my writing better with every draft and every book. Most of all, keep writing. But then, if you’re like me, stopping was never an option.